Facing the unexpected adversities that life throws at us is never easy. I’m reminded of a quote by, of all people, former boxing great Mike Tyson. I’m a sports fan. I like almost every sport there is. I suppose that’s why when I was younger, I wanted to be a sports writer or announcer. Football has always been my favorite, but I like about everything, even boxing. I used to love watching boxing when it was still popular and the big matches were on TV (I attribute a big part in the decline of boxing’s popularity to a bad marketing decision, but that’s for another blog and another time). 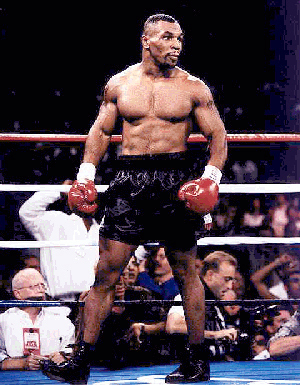 Probably my favorite boxer was Tyson. Before the ear biting, before the face tattoo, even before Robin Givens, Mike Tyson was a phenomenal boxer. He was, as some might have said, the Baddest Man on the Planet. During his run as world heavyweight champion, he would enter the ring wearing only black shorts and black boxing shoes. And a scowl. He was intimidating. He was fearsome. And he was a great fighter. I remember once going to a friend’s house to watch a fight. It was going to be on HBO or Showtime or some channel I didn’t get. We were all set to watch what was supposed to be a great fight between Tyson and his top challenger, Michael Spinks. Tyson was fun to watch in those days. But I also found him engaging, often more open and honest than most celebrities in front of a microphone. One of his quotes always stood out to me. Before one of his fights, a lot had been made about what his opponent planned to do during the fight; he had a plan that he felt sure would work. Tyson was asked what he was going to do about his opponent’s strategy. To paraphrase, Tyson said, “Everyone has a plan . . . until they get hit.” (His actual quote was “. . . until they get punched in the face”). And I thought, how insightful is that. Not just in boxing, or even in sports. How often in life do we have good intentions, a great plan to face the day. Only to watch it fall to pieces once one hit derails us? Times when circumstances deliver a blow to our lives and whatever plan we had is now worthless. And leaves us with no plan at all. Times when health issues, or economic of financial hardships hit close to home. And other times when we bring hardships on ourselves. Times when you make a stupid mistake, and then watch your best plans crumble. I’ve proven quite adept at this, sometimes losing people or things I care deeply for. As parents, we face this situation almost daily (sometimes hourly!). We have plans of how we’re going to raise our kids, or handle them in certain situations. Or how we want them to turn out. What becomes important isn’t so much the plan we had, but how we handle the adversity. How do we handle the new situation that we find ourselves in. It’s in times like these that patience and adaptability become key. And our kids are watching us in how we deal with these situations, whether the issue is one that concerns them or us, or even the entire family. Yes, it’s good to have a plan. But how we deal with adversity is equally important.